Rotating axis grabs grip the ends of the load to change its orientation by rotating it about its horizontal axis. 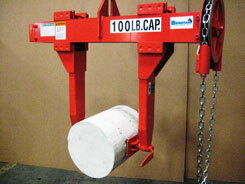 This lifting device can be operated manually or may be powered by an electric or air motor. The motorized rotating axis grab has increased the efficiency of an assembly process at a Falk Corporation plant in Milwaukee, WI. Falk is a manufacturer of industrial-mechanical power transmission components. Falk needed equipment to lift and rotate machined gear housings to give assemblers access to the top and bottom of the housing. This design allows the customer to position the gear cases properly, thereby eliminating product damage and improving the assembly process. The grab grips the outside of the gear case and rotates it 90° horizontally. A self-locking acme screw shaft, actuated by a motor, provides the gripping strength. In addition, a set of specially designed sliding incline planes automatically increases the gripping force based on the weight of the load. A reducer with an adjustable torque limiter protects the motor. An acme screw assembly, which accommodates a variety of gear cases with different centers of gravity, adjusts the bail. Two self-locking worm gear reducers, driven by electric motors, enable the rotation process. The 100 pound capacity rotating axis grab is a roll lifter that can safely grip the load using the friction force between the load surface and the rubber pad. It has a hand chain wheel to move the lifting legs in and out to accommodate different load diameters. The chain pull force combined with the friction between the load surface and the gripping pads allow the load to be safely gripped in either vertical or horizontal orientation. Load rotation is by means of a manual lever to avoid touching the load directly during rotation. 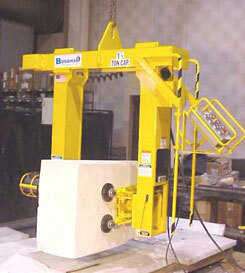 This motorized rotating axis grab was built for a facility that makes refractory products for glass casting furnaces. 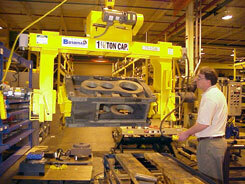 The Model M2038 motorized rotating axis grab has a capacity of 3,000 pounds. It was designed to lift and rotate graphite blocks from six to 20 inches wide. The blocks are 42 to 70 inches long. The grab uses a self locking acme shaft, actuated by a gear reducer with electric motor, to grip the blocks. The gripping pads are mounted on an inclined plane to ensure safe and positive load engagement. The pads pivot in two directions to conform to the uneven surface of the blocks. A self-locking gear reducer actuated by an electric motor accomplishes rotation.